As I mentioned, I’m WAY behind, so here is a cake from about 10 weeks ago… A Drum Cake, or at least, that’s what I’m calling it. 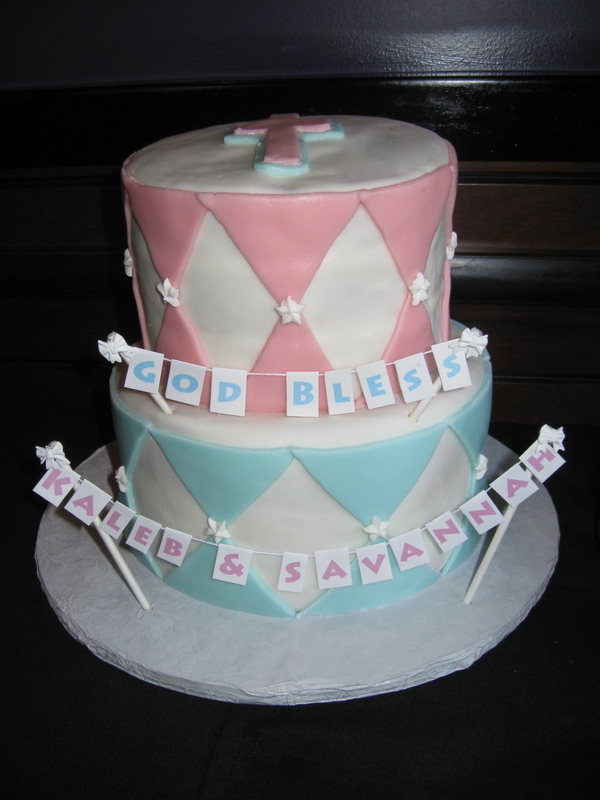 A friend contacted me because she was having her son and daughter dedicated at the same time, and wanted a cake to represent and celebrate both of them. She had found a picture of something similar and requested a few personalizations. Generally, I’m hesitant to make a cake based on a picture. I’m always afraid that in copying another picture, the cake will fall short from the client’s expectations. If they have a clear idea or expectation in their mind about what they want, it’s sometimes hard to live up to that in reality. Plus, if things don’t go as planned, then I don’t have as much flexibility in the process to change the plans. But, this concept seemed simple enough, and with the personalizations, I agreed to make the cake based on the provided photo. Each tier was three layers of vanilla cake with raspberry filling in between. I did a six inch and an eight inch. I used a basic vanilla buttercream under the fondant. 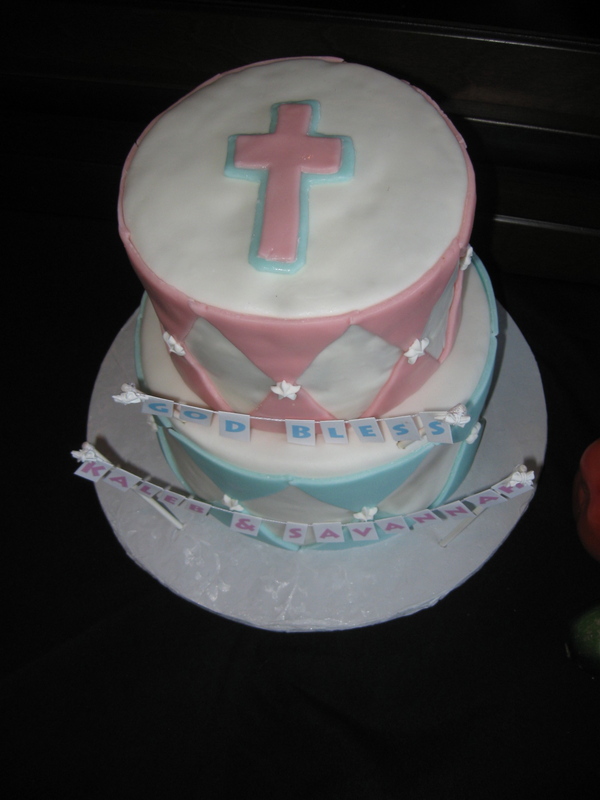 And the pink fondant, (as with the first communion cake) was made from strawberry marshmallows. I was so flattered the next morning when Wendy called me to thank me again and let me know how much they enjoyed the cake. They were not only pleased with the look, which is important, of course, but they also thought it tasted delicious! And that is the most important part! 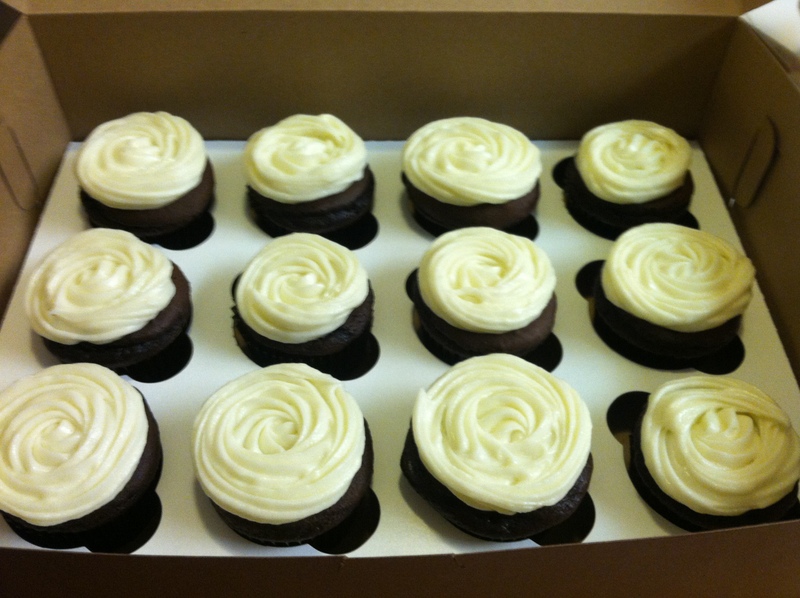 These cupcakes are a basic chocolate fudge cake, delicious in and of itself if you ask me. But I wanted something richer, so I really went for it. 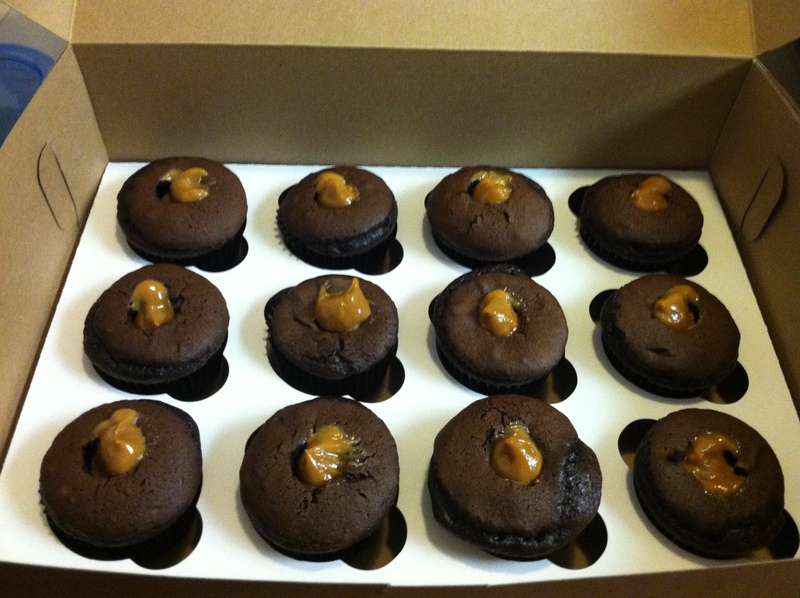 I used my apple corer to empty a small well inside the cupcakes, then filled it with caramel. And, it’s the easiest caramel ever to make. Simply fully submerge a can of sweetened condenses milk in water in a crock pot and turn it on low for about 6 hours. That’s it! Once its’ cooled, open the can to find wonderfully creamy caramel. I scooped the caramel into a ziplock back, snipped of the corner, and squeezed some into the center of each cupcake. I whipped up a batch of cream cheese frosting, for the top. The frosting consists of one block of cream cheese, one stick of butter, about a teaspoon of vanilla, about a tablespoon of milk, and about a pound of powdered sugar. I use the term “about” when referring to these measurements because it all depends on the texture you’re going for. I wanted smooth and creamy, but still firm. The cupcakes were so rich and the caramel inside was a wonderful surprise. Of course I totally forgot to take a picture of them all finished and placed on the cupcake tower. I also had plans to drizzle them with caramel sauce as a garnish (and as a clue to what’s inside) but when I went to the store to get the caramel, I got a distracted by the other things I needed and totally forgot about it. So I ended up adding a few prickles instead.